The very last of the 2008-W American Eagle Proof Coins dropped Monday from the Mint’s online shopping store. It withstood several days of delayed shipping notices, which has become a signal for a fast approaching end to 2008-dated coins. The 1/10 oz coin had been the sole surviving option in the proof collector’s series after the 1/4 oz coin sold out back on Jan. 5. According to the most recent Mint sales figures, 13,580 of the individual coins have been sold, plus the 13,072 within the 4-coin set. The option experienced strong collector demand recently. 1,911 coins were sold over the previous weekly report for a 16.4 percent increase. 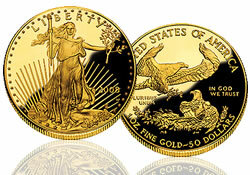 With the single 2008 Eagle Silver Uncirculated Coins selling out Friday as well (they are still available within the Annual Uncirculated Dollar Coin Set), the American Eagle Gold Uncirculated coins take center stage for 2008-dated bullion collector options. All sizes — one ounce, one-half ounce, one-quarter ounce, one-tenth ounce and the 4-coin set — are still available. The CoinNews collector tool page Mint Coin Guide has been updated. It includes the latest US Mint prices, product links, coin premiums over bullion spots, and sales figures for silver, gold and platinum collector coins.